SC ComiCon is another convention focused on comics that just so happens to be in the TD Convention Center in Greenville, SC. On Saturday, March 21st and Sunday, March 22nd, fans can join Valiant for a weekend packed with giveaways, creator signings, exclusive merchandise, and special events you won't find anywhere else. Visit Valiant at Booth #600 to take home a complete library of trade paperback and hardcover collections for X-O Manowar, Bloodshot, Harbinger, Quantum and Woody and many more of Valiant's top titles. "Having been a Valiant fan since the inception of the company, I am thrilled to have Valiant have an increased presence at SC Comicon this year!" said Robert Young, the founder of SC ComiCon and founder and owner of Greenville's Borderlands Comics and Games. On hand will be an all-star team of X-O Manowar creators, including writer Robert Venditti, cover artist Lewis LaRosa, and colorist Brian Reber, signing an SC ComiCon-exclusive X-O Manowar: Dead Hand print, showcasing LaRosa and Reber's riveting artwork from the series' latest smash-hit story arc. Get it signed at the SC ComiCon merchandise booth on Saturday and Sunday. But that's not all! Visit the SC ComiCon merchandise booth to grab another Valiant milestone in the making – an SC ComiCon-exclusive t-shirt, featuring all of Valiant's greatest heroes by Eisner Award-nominated superstar Butch Guice. Last but not least, SC ComiCon attendees can become the hero behind countless saved lives throughout the weekend by donating blood at the Blood Connection inside the TD Convention Center. Each donor will receive a complimentary Bloodshot Reborn t-shirt, featuring the stunning artwork of red-hot artist Mico Suayan, on behalf of Valiant and SC ComiCon. Robert Venditti, Lewis LaRosa, Brian Reber, and More! Plus: Exclusive Merchandise and a Very Bloodshot Blood Drive! This March, Valiant is bringing the best reviewed line-up of titles anywhere in comics today to SC ComiCon 2015! On Saturday, March 21st and Sunday, March 22nd, join Valiant inside the TD Convention Center in Greenville, South Carolina for a weekend packed with giveaways, creator signings, exclusive merchandise, and special events you won't find anywhere else! Visit Valiant at Booth #600 to take home a complete library of trade paperback and hardcover collections for X-O Manowar, Bloodshot, Harbinger, Quantum and Woody, and many more of Valiant's top titles! 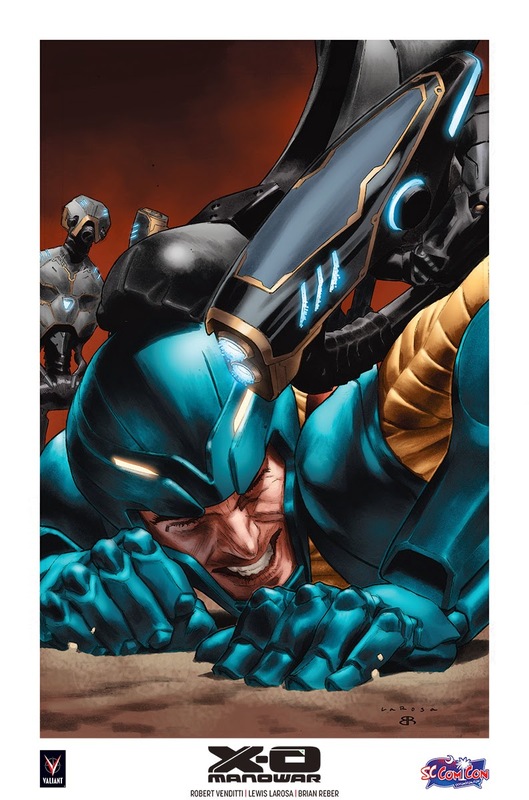 And don't miss an all-star team of X-O Manowar creators, including writer Robert Venditti, cover artist Lewis LaRosa, and colorist Brian Reber, signing an SC ComiCon-exclusive X-O MANOWAR: DEAD HAND print, showcasing LaRosa and Reber's riveting artwork from the series' latest smash-hit story arc. Get it signed at the SC ComiCon merchandise booth on Saturday and Sunday! But that's not all! Visit the SC ComiCon merchandise booth to grab another Valiant milestone in the making – an SC ComiCon-exclusive t-shirt, featuring all of Valiant's greatest heroes by Eisner Award-nominated superstar Butch Guice! We'll see you at SC ComiCon! For tickets, directions, and more, visit SCComiCon.com.